Hi! I’m Emma from Emma Jewell Crafts popping into the Obby blog today to give you a lovely Valentine's DIY! With Valentine's Day around the corner, I wanted to create something a little more special than the usual shop bought card. I though about how lovely it would be to receive a mini look back on the past year with a little Valentine’s scrapbook filled with moments you have shared together; something you can keep forever and look back on. I am very guilty of hoarding bit and pieces from dates and trips I've been on with my partner. Tickets, receipts, postcards and gift tags can all be found in a forgotten pile along with hundreds of selfies sat on my phone that we took and never did anything with. Now I am finally going to do something with them and create a super special alternative to a card to give to my significant other this Valentine's day. Haven’t got a Valentine? 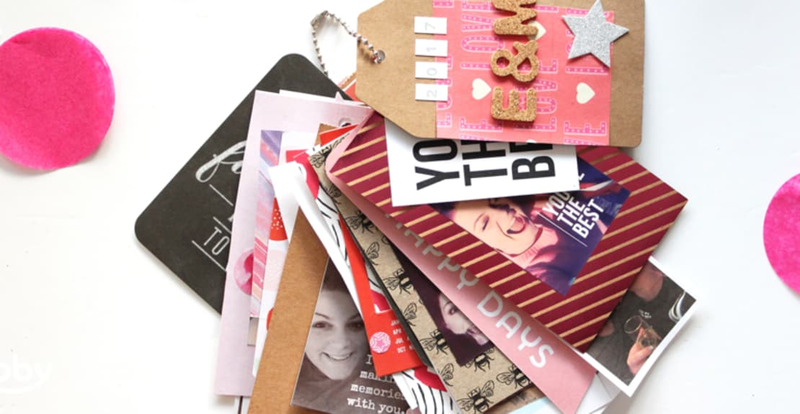 Make a mini scrapbook for your BFF for Galentine's day! Gather all of your tickets, receipts and bits and bobs! I even used some of our text conversations by screenshotting them and then printing them out! Gather your supplies! There is no limit to the amount of stuff you can gather here. Scraps of card and paper along with tags will work great for the base of your scrapbook. Then pick out stickers, washi tape anything to make it look pretty. I’ve decided to go for a full-on red and pink valentines theme, but it’s totally up to you. Cut your card and paper pieces to around 8x12cm, they don’t have to be the same size but this is a good place to start. Play with some smaller and thinner pieces. Use the hole punch to punch a hole at the centre top of each piece. Take each piece of card and decorate it with photos, washi tape and stickers. Go wild! This is the part I love! Layer up different papers, then add stickers on top. Don’t forget to decorate the back of each piece, as when flipped through the back of each piece will be exposed. I used pretty paper to decorate the backs of any pieces I wasn’t adding a full spread to. Add little notes too, this will make it ultra personal. I added little decorative pages just to make it look ultra cute and break up the photos a bit. Hole punch any quote cards, tickets, notes and photos that you don’t want to decorate, they can be added in later. Start layering up your pieces, It’s totally up to you how you want to do this. I went for a free for all approach as I am very unorganised and like the random look, but you could make it into a little story and add everything chronologically or start with the bigger pieces and work up to the smaller ones. The world is your mini scrapbooking oyster! Start threading the pieces onto the chain, start with the last piece first threading one by one until all of your memories are attached and you can fasten the chain together. By using the chain you can easily go back and add bits in or move them around. Make a little cover for your scrapbook, I added our initials and the year, then a little message on the back. Find a cute little envelope to pop your scrapbook in to make it the perfect surprise for Valentine's day. Watch out you might have started a new crafty valentines tradition!